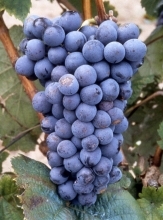 This vine variety is originally from the South west of France (Tarn and Garonne). No synonym is officially recognized in France for this variety, nor in other countries in the European Union. In France, Mérille N is officially listed in the "Catalogue of vine varieties". Grape maturity: period II, 3 weeks after Chasselas. Steady production. High yields when long-pruned. 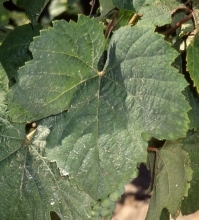 This vine variety is not very prone to downy and powdery mildew. It is somewhat susceptible to grey rot and more so to mites, grape caterpillars and leaf hoppers. Grape clusters are very large and the berries are large. Mérille N produces light (low sugar potential) and rather ordinary wines. The 3 approved Mérille N clones carry the numbers 444, 445 and 790.